It is cherry time again and the pitter is at the ready. Last year it was put to good use as I removed the stones from an abundance of fruit going well into the night. This year I’m unlikely to be so lucky … or unlucky depending how you look at it. 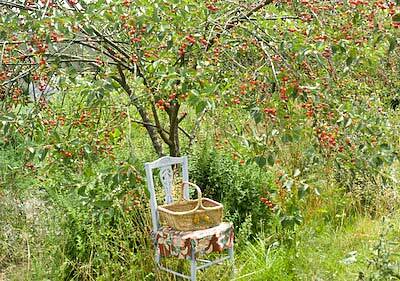 The cherry harvest is nowhere near as lush as it was in 2010, but that’s OK. I like my canning years to have distinctive differences, so each year I have new ingredients to find and explore. I’ve still got some jars of canned morello cherries in the larder as so many were put away last summer and the joy of canning means you can store enough to see you through more than one season, if you do it right. Morellos are a sour cherry, for culinary use only, that I have never found for sale. The ones I preserved in a light syrup were, on first tasting, fairly undistinguished and plain – no big deal. That is until you add a splash of kirsch and pour on some cream, and then they become something totally exquisite. I have served them that simply on many occasions since last summer and opened a jar to make the filling of a black forest brownie cake more than once. So this year my cherry canning is set to be on a modest scale. 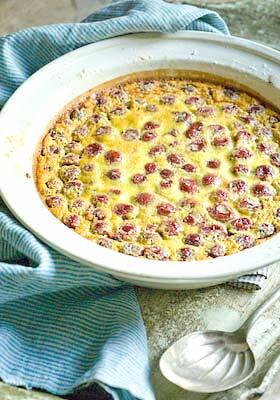 Cherry clafoutis is another traditional pudding that uses sour cherries and works well with fresh or bottled fruit. This isn’t time to skimp on filling – it should be well packed with fruit with all the gaps adjoining melded with custardy batter. There is some debate as to whether you should leave the stones in the fruit or remove them. As the stones imbue a slight almondy flavour to the pudding, many people say they are essential. I prefer to serve and eat food without the hassle of filching out stones as I go, so add a splash of amaretto or kirsch to complete the flavours. 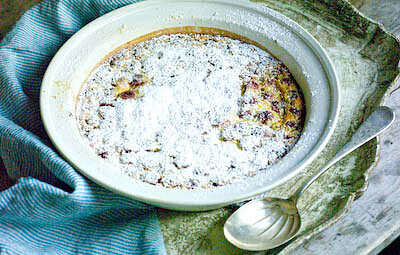 A clafoutis is so easy to make and needs to be eaten whilst still warm from the oven, though having said that, I have eaten leftovers for breakfast the next day, and very nice it was too. Any syrup remaining can be drunk like cordial with sparkling water added. Butter a 25cm diameter earthenware or enamel dish. Pre-heat the oven to 200C (400F, Mk 6). If you are using a mixer, just throw the first 6 ingredients together and beat together to form a smooth batter. Working by hand, whisk eggs, sugar, vanilla and salt together, then add the flour followed by the milk to make a smooth batter. Pour half into the prepared dish, spread the cherries over the batter and splash with a few teaspoonfuls of your chosen liqueur. Pour the rest of the batter over the fruit. Bake for 40-45 minutes until the top is lightly golden and the custard centre is beginning to set. Leave to cool for a while so the custard sets further. Serve warm dredged with icing sugar and another drizzle of liqueur if you like. When we lived in the Limousin I learned that a clafoutis can only be made with cherries if any other fruit is used it is called a Floganade. Whatever it is called it is delicous isn’t it? Oooh, this looks delicious Gloria. Have you got your chickens yet? I love your title, it made me giggle. Hi! That actually looks delicious. I love cherries but have never liked anything made out of/with cherries. But this looks like it could be an exception! Exquisite, all of it. I want the cherries splashed with kirsch and cream, the black forest brownie cake, and the clafoutis. I love this post. I want to taste all you described. They all sound delicious. lovely can taste them now being so much farther North than you and higher up it will be another 5 weeks until my cherry harvest. 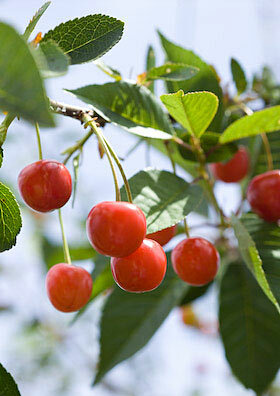 No more cherries on my tree, looking forward to making this next year. love this site.